I love pita bread. 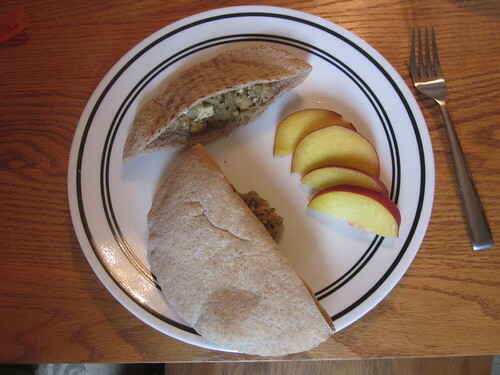 Pita bread makes it easily possible to really experiment with almost anything as a sandwich filling. 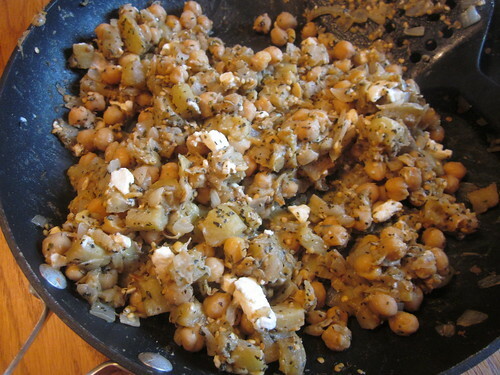 Hence a sandwich made from crumbled feta cheese and chickpeas that turned out to be surprisingly delicious. This recipe is based on one found in the Bon Appetit Fast Easy Fresh cookbook that has long been a part of our kitchen cookbook shelf, requisite wear and stains and all. We often use cookbooks for inspiration, but rarely follow recipes verbatim. As always, prep the vegetables early. Cook the beans if you’re using dried beans (and don’t forget to reserve 1/2 cup of the liquid at the end). Chop the onion. Store all of this stuff in the refrigerator. Put the oil in a skillet, spread it around, then heat it over medium-high heat. Add the eggplant and the onion, then saute for nine minutes or until the oinion is starting to turn brown (it’ll smell great). Mix in the beans, lemon juice, and cumin and saute for a minute, then add a few spoonfuls of the reserved liquid. Saute for another three minutes and keep adding the liquid by the spoonfuls if the mix looks dry. You want it to be very moist but not runny. 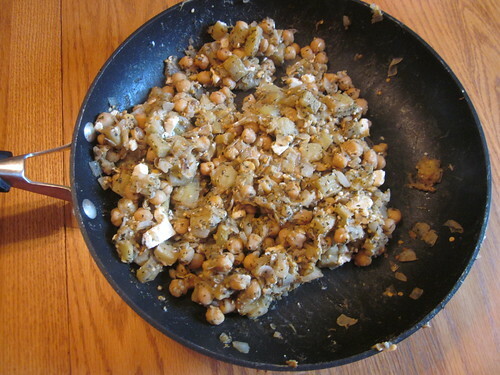 Mix in the feta and the mint, then remove from heat. Cut the pita breads in half lengthwise, then stuff the halves with this mix and serve. We ate the sandwiches with a sliced fresh peach obtained from a friend. This recipe works very well as-is because of how the flavors mesh, but you can use almost anything within a pita and it will turn out well. Experiment with what you have in hand and find things that work well. We’ve made lots of things in pita shells, ranging from Greek-styled food (like this) to things that are practically tacos.